Watch the MIDAS presentation at the September Advisory Council meeting. At its September 2017 meeting, our Advisory Council endorsed the concept of a MIDAS Coordination Center. MIDAS, or the Models of Infectious Disease Agent Study program, is a collaborative network of research groups that focus on developing bioinformatics tools and computational models to understand the interactions between infectious agents and their hosts, disease spread, prediction systems, and response strategies. 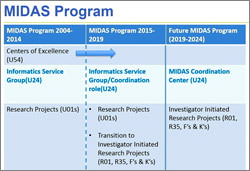 Initially the MIDAS network consisted of research centers (U54s), research projects (U01s), and an information service group (U24). These activities will expire in 2019, and NIGMS is shifting the focus of this program to an investigator-initiated research portfolio consisting of R01s, R35 MIRA grants, and fellowships and mentored career development awards (Fs, Ks). However, modeling of infectious disease agents continues to be an active area where a coordinated effort is needed. NIGMS Council members supported the concept of a MIDAS Coordination Center. We envision the MIDAS Coordination Center to serve as a focal point for collaboration and training as well as testing and dissemination of MIDAS research products. The center will also act as the point of contact between the MIDAS network and public health organizations. We expect to issue a funding opportunity announcement in early 2018, and we encourage the community to watch the presentation at our Council meeting to learn more about this program. We welcome your input and feedback on these plans. You can email your comments to me or post them here. My BTRR presentation at the September 2016 Advisory Council meeting begins at 2:23:15. Increase the flexibility and nimbleness of the program. Incorporate a broader range of technologies into the program. Increase new research directions and program turnover and implement a comparative review process. 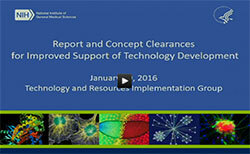 Enable better integration of the program with the overall technology development plans at NIGMS. The revised BTRR program will provide greater flexibility for the investigators to support a wider range of approaches for technology innovation and dissemination. The program will include collaborative subprojects to integrate emerging technologies in fast moving fields and to provide access and dissemination of these technologies. In addition, research resources funded through this program will have greater flexibility to tailor approaches for providing access, training users and disseminating the specific technologies to the communities being served. These changes will better support the dual mission of the BTRR program: to develop high-impact technologies that enable biomedical research, and to move those technologies into wide use in the community. We expect a funding opportunity announcement to be published in the NIH Guide later this year. In order to improve consistency in the review of competing applications, the NIH Center for Scientific Review will convene a special study section. We anticipate that most BTRR centers will not be renewed beyond three cycles (15 years) and we will require investigators involved with this program to formulate a sustainability plan for their research resources. We welcome your input and feedback. You can email your comments to me or post them here. At its September 2015 meeting, our Advisory Council endorsed a concept for funding existing NIGMS-supported synchrotron resources in which the technologies have become mature. This plan will align the funding mechanism used to support the beamlines with the goal of ensuring reliable access to these essential resources for structural biology. In place of the variety of mechanisms we currently use, we intend to issue a funding opportunity announcement (FOA) called Mature Synchrotron Resources (P30) for 5-year, renewable grants in the range of $1-3 million per year in direct costs. The Institute intends to maintain overall support for mature beamline facilities at the same level it has in the past, but to replace the previous constellation of funding mechanisms with a single, more coherent one. The focus of the FOA will be on user access, training and support in data collection, processing and analysis. Peer review will assess the resources primarily on their ability to meet the research needs of the user community and on the impact the resources have on their users’ scientific productivity. To ensure that the beamlines maintain their state-of-the-art operations, the FOA will also include support for a limited amount of technology development and implementation. Since the goal of the effort is to improve the stability of current NIGMS-supported synchrotron structural biology resources for community use, the initial funding opportunity will be open only to synchrotron-based resources already supported by NIGMS. We welcome your input and feedback on these plans. You can email your comments to me or post them here. Charles Edmonds, Susan Gregurick, Ward Smith and Mary Ann Wu contributed to this blog post. At last week’s Advisory Council meeting, I presented a report on the comments we received in response to our request for information (RFI) on a potential new program for research funding. As described in the blog post announcing the RFI, the Maximizing Investigators’ Research Award (MIRA) program would provide a single award in support of all of the projects in an investigator’s lab that are relevant to the NIGMS mission. 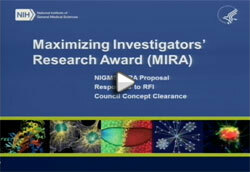 A MIRA would be longer and larger than the current average NIGMS R01 award. We received more than 290 responses through the official RFI comment site. We heard from individual investigators as well as several scientific organizations. Most of the responses were positive, and both established and early stage investigators indicated that they were very likely to apply. Enhanced stability of research support. However, some responses expressed concerns, which we are taking into consideration. Despite the intention of the program to optimize the distribution of NIGMS resources, some respondents thought that it could lead to funds becoming concentrated in fewer labs at the most elite institutions. This was in part a reflection of the phased implementation plan, which would focus initially on investigators with more than one NIGMS grant. Respondents urged NIGMS to broaden the eligibility criteria as quickly as possible following the initial pilot phase. Other concerns that were raised related to peer review and program evaluation. For more about the RFI results, including a breakdown of responses by question, watch my presentation, which begins at 2:18 on the archived videocast. The Advisory Council discussed the MIRA proposal and then approved plans to proceed with developing the program. We plan to issue a funding opportunity announcement in early 2015, with the first awards being made in Fiscal Year 2016. We intend to evaluate the MIRA program and if it is successful, will broaden it.